[T]he problem with statistics is that they’re misleading. 8 times more likely… 8 times what? You need to find out what the baseline actually is, and you need to find it out for your own ethnicity, gender, circumstances before you know if this is a problem. If for example the baseline is 10% then 8 times is pretty ghastly, however, if the baseline is 0.01% then you’re still at 8 times 99.92% likely to NOT get one. I’m kind of embarrassed I didn’t think this through before I wrote the post. I’m always urging readers to think critically. No matter how much I recommend caution, I too fall into the trap of fear. “Stroke? Eight times more likely? No way!” is how I reacted yesterday. According to the American Heart Association’s stroke risk factors, I’m at very little risk. That’s reassuring. I’ll talk with the doctor on Monday and see what she recommends. Check out the this BBC article on understanding — and critically evaluating — statistics, which Kersti suggested. In recognition of the 15th annual National Headache Awareness Week, the National Headache Foundation (NHF) is announcing a series of events across the country in order to educate the public about types of headache and their impact on daily living, as well as stressing the importance of seeking an accurate diagnosis and appropriate treatments. 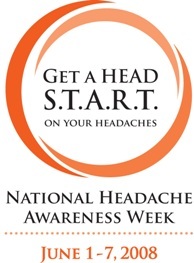 This year’s National Headache Awareness Week takes place June 1-7, 2008. Nearly 21 million people were reached last year through this successful annual campaign. Activities taking place across the country this week include headache screenings, educational seminars led by expert physicians, menstrual migraine awareness events and a 5-part podcast series focusing on women’s headache issues, a radio news release and the launch of a non-profit NHF channel on YouTube. Seek diagnosis — Obtaining the correct diagnosis for your headache is the first step toward effective treatment. Triggers — Identify and track your triggers (e.g., foods, stress, hormonal and weather changes) by keeping a headache diary and share this information with your healthcare provider. Advocate — Be an advocate. Be informed. Be a participant in your headache care. Resources — Utilize the National Headache Foundation as a resource. Visit www.headaches.org for the latest information about headache causes and treatments, or call 1-888-NHF-5552. Treatment — Successful treatment may include medications and lifestyle changes. Work with your healthcare provider to find the right plan for you. For the first time, this year’s campaign is drawing specific attention to menstrual migraines by designating Wednesday, June 4th as National Menstrual Migraine Awareness Day. In support of Menstrual Migraine Awareness Day efforts, the NHF will also be releasing new survey data from a recent poll of its website respondents suffering from menstrual migraine. Additionally, the NHF is hosting a five-part podcast series specifically addressing women’s headache issues including Hormones & Headache, Contraception & Headaches, Pregnancy & Headache, Menopause & Headaches and Menstrual Migraine. Podcasts and expert questions and answers are available through links on the National Headache Awareness Week page.